Seven priceless artifacts recovered from the wreck site of RMS Titanic will be retired from public view and returned to its conservation facility after a 3-month special engagement at Titanic: The Artifact Exhibition at Luxor Hotel & Casino in Las Vegas. Beginning April 15, 2016, 104 years after Titanic hit an iceberg in the Atlantic and sank, taking the lives of 1,523 passengers and crew, and nearly 30 years after the Company first brought artifacts from its wreck site to the surface, these priceless treasures will be displayed for a final time. 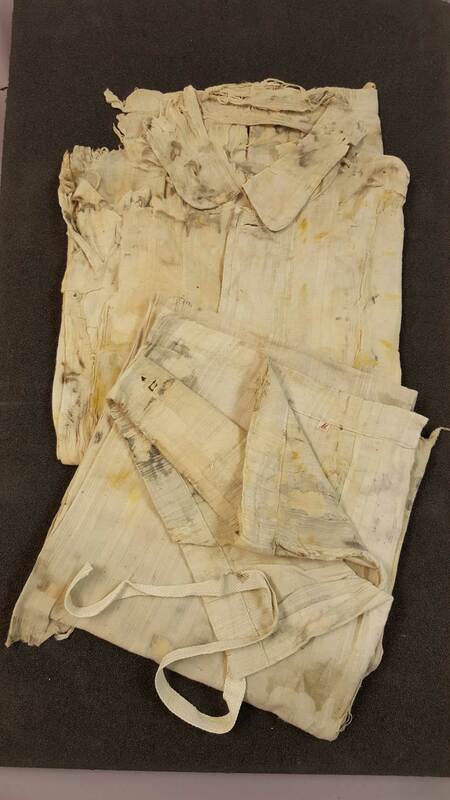 The artifacts, which include textiles, personal goods and paper documents, have previously been on display around the world as part of Premier’s Titanic: The Artifact Exhibition. They will be shown for a limited engagement at the largest permanent exhibition of Titanic artifacts at Luxor Hotel & Casino in Las Vegas through July 18, 2016. They will then be returned to the Premier Exhibitions conservation facility and put in long term monitored conservation, remaining available to historians, archaeologists and other qualified researchers. 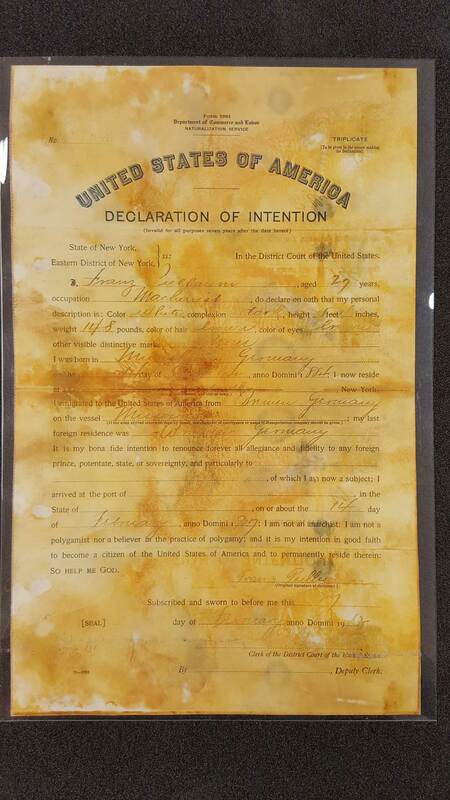 Declaration of Intention Form: 2nd class passenger Franz Pulbaum, a machinist originally from Germany, clearly intended to become a U.S. citizen upon his return to New York City. He had been on a business trip to Luna Park amusement park in Paris. The form would have been used to allow him a smooth disembarkation. 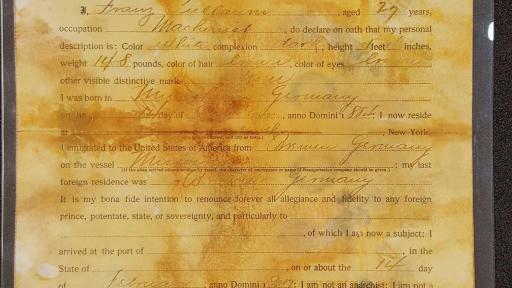 Pulbaum’s signature and personal information is still legible on the naturalization form. Pulbaum never became a U.S. citizen, he went down with Titanic. 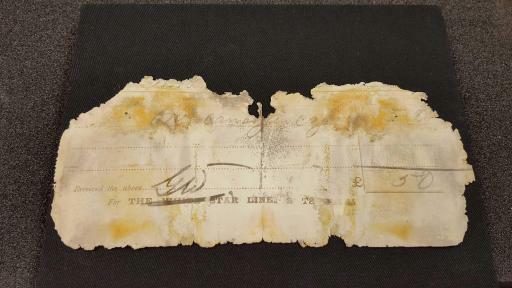 White Star Line Receipt for “One canary in Cage”: Recovered from Marion Meanwell’s alligator purse, this small receipt fragment appears to confirm that 3rd class passenger, Mrs. Meanwell (nee Mary Ann Ogden), a milliner from Eastbourne Sussex, England agreed to transport a relative’s canary from Southampton to Cherbourg. Additional information suggests that Chief Purser Hugh Walter McElroy took responsibility for the bird, while transport payment was provided by Mrs. Meanwell. Cotton Pajamas: This pair of men’s pajamas is made of white cotton with blue stripes. No maker marks were found, they are a size medium with button shirt and drawstring bottoms. The deterioration around the neck and body appear to reflect normal wear and tear. 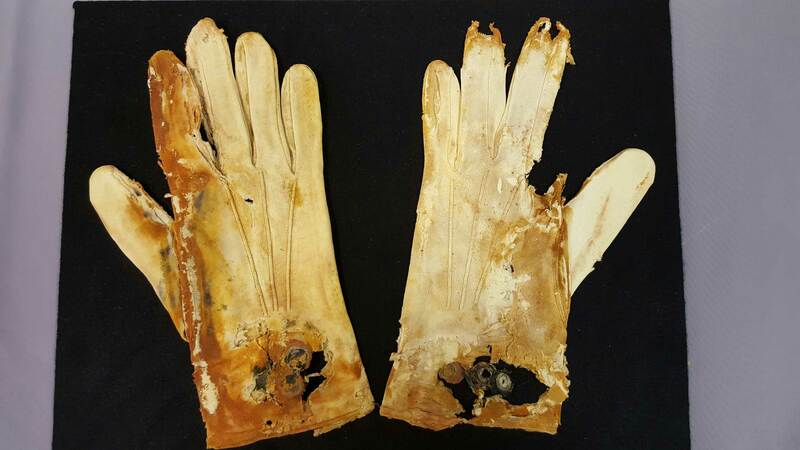 Pair of Gloves: This degraded pair of cotton gloves was originally white and probably belonged to a gentleman. They are still attached at the cuff, so they had not yet been worn. The gloves were recovered from a suitcase containing unmarked pajamas, jackets, and other clothing. Waiter's Pad Blank Page: Waiters from the exclusive à la carte restaurant on board would jot down lunch and dinner orders on pads such as this for the chefs to prepare in the galley. Unlike the First Class Dining Saloon, which cooked in larger quantities, the à la carte restaurant prepared each individual meal to order. Pair of Socks: This is one of three pairs of cotton and silk socks recovered from a single suitcase. 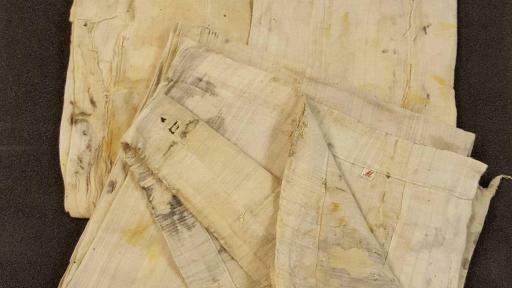 These were neatly folded by the owner for his Titanic journey. While the clothing in this passenger’s suitcase was of good quality, these socks have been darned in several places, showing a thrifty character as well. Left Shoe: This men's leather shoe fragment consists of the welt, top cap and partial quarter with the insole. 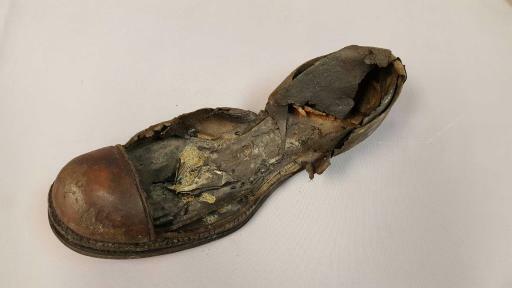 Attesting to the meticulous care under which all artifacts are conserved, this shoe has never been previously exhibited due to its fragile condition. This will be its first and only time on public display. All seven soon-to-be retired artifacts will be put on display at Luxor Las Vegas on April 15, 2016, the 104th anniversary of the sinking of Titanic. 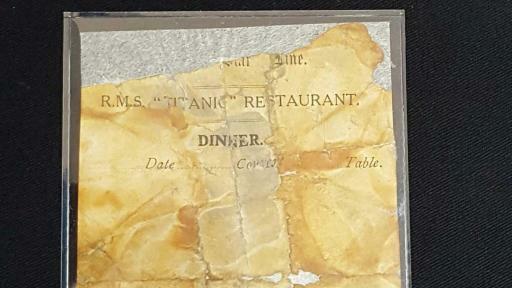 They will be housed in a special conservation case where visitors to Titanic: The Artifact Exhibition can view them until their retirement this summer. Dedicated to preserving Titanic’s legacy, Titanic: The Artifact Exhibition takes guests on an emotional journey through the life of the legendary ship. Along the way, visitors learn countless stories of heroism and humanity, paying tribute to the indomitable force of the human spirit in the face of tragedy. Titanic: The Artifact Exhibition at Luxor Hotel & Casino is open daily from 10 a.m. – 10 p.m. with the last admission at 9 p.m.
For more information and ticket prices, please visit www.PremierExhibitions.com. Premier Exhibitions, Inc. located in Atlanta, Georgia and Vancouver, British Columbia, Canada; is a foremost presenter of museum quality exhibitions throughout the world. Premier is a recognized leader in developing and displaying unique exhibitions for education and entertainment, including Titanic: The Artifact Exhibition, BODIES...The Exhibition, Tutankhamun: The Golden King and the Great Pharaohs, Pompeii The Exhibition, Dinosaurs Unearthed, Dinosaurs Alive!, Extreme Dinosaurs, Xtreme BUGS!, Creatures of the Deep and Real Pirates in partnership with National Geographic, as well as Saturday Night Live: The Exhibition. 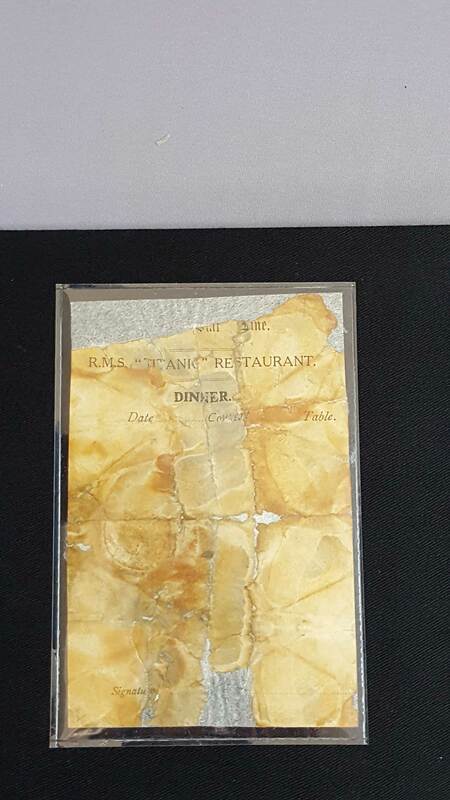 RMS Titanic, Inc., a wholly owned subsidiary of Premier Exhibitions, Inc., is the only company permitted by law to recover objects from the wreck of Titanic. The Company was granted Salvor-in-Possession rights to the wreck of Titanic by a United States Federal Court in 1994 and has conducted eight research and recovery expeditions to Titanic recovering more than 5,500 artifacts. In the summer of 2010, RMS Titanic, Inc., conducted a ground-breaking expedition to Titanic 25 years after its discovery, to undertake innovative 3D video recording, data gathering and other technical measures so as to virtually raise Titanic, preserving the legacy of the Ship for all time.